Social media is the new way to find a job! While it’s also a great way to catch up with friends, make new friends, find dates and just waste some time it’s also fast becoming a way to find and land a new job. So, where do you look if you want to find the job that’s right for you? LinkedIn – if you’re not really into the whole Face book *scene* and you prefer to keep family/friends and work separate then LinkedIn is tailor made for you. This is one site that allows you to keep the two apart and unlike other social networking sites LinkedIn is dedicated to services and businesses only and currently is the hangout for over 150 industries worldwide with over 24 million LinkedIn users. Rather than having a list of friends, your favourite movies, books and beers all of these are replaced with a serious listing of your work, resume, and achievements. Rather than joining groups *Holden appreciation guys* or *Fans of Master chef* LinkedIn members join professional and industry groups in order to stay in touch with old colleagues or to make new ones. Moving away from *word of mouth* companies and businesses are now beginning to actively recruit from LinkedIn. You can search for work through the site, just as you would with seek.com or alternatively you can search for jobs that have been posted by those on your LinkedIn network. To take advantage of this you need to have a solid network and recommendations from your contacts. At LinkedIn you will be able to see who your colleagues work for, so you can always ask your colleagues for introductions and job information. The LinkedIn site is great for people to chase careers. MySpace is the more *traditional* hangout for those who are a little more alternative. For a long time MySpace has been the domain of bands and other creative types who can market themselves for free. Bands can set up playlists and build groups of fans which is a cheap and wide reaching marketing tool and isn’t that the best sort there is? Photographers, artists, models and graphic designers are uploading samples of their work and being seen by employers who are looking for new talent. If you are going to travel along this route, it’s best to have a webpage you can direct potential employers to so they can not only see what you can do, but they can see how serious you are at turning your talents into a career. In December 2007 CareerOne and MySpace joined forces, which in turn has given the 3.1 million Australian who visit MySpace each month access to the over 68,000 jobs listed on the CareerOne website. If you are looking for a straight laced 9 to 5 job, don’t bother looking here, but if you think outside the box and are creative then this could be the best place for you. Face book has lots more members who are looking for more than *pokes* andwho like to chat, not just share jokes and shop. The key to this site is being able to catch up with old friends, work colleagues, friends of friends and any number of people who could help further your career. It’s the newest way to *network* and you could end up in the right place at the right time when your dream job comes on the market. The face book team have added some great new career applications – LiveSeek allows job seekers to browse through available positions and to be able to chat and *sell themselves*. Jobster can also do all sorts of weird and wonderful things. You can join the *talent networks* of your favourite companies, get sent job alerts based on your career interests, and you can even post your resume online. Face book is proving quite popular with companies who can customise their Face book pages to sell themselves to job hunters. 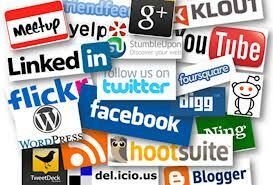 Do you use social media in your search for a job? Have you used it? Do you plan to? Is this the way job hunting is going??? We’d love to hear your thoughts.